Purchase your Blank Decks from Spaghetti at $30 which includes your registration fee. Registration starts on January 30th. All entries must be submitted by deadline of March 17. There is a $15 per deck entry fee for any decks not purchased at Spaghetti Project. There are no limits on the number of decks you can submit. Any medium goes: paint it, collage it, cut it, carve it, color & create it, deconstruct it, reconstruct it, you name it - as long as there is a skateboard involved! Open Reception will be held at Spaghetti Project on Saturday March 20th, 5pm - 10pm. All featured artists decks will be for SALE!!! 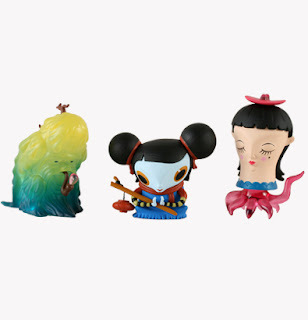 Be entranced by the newest Dunny series, Dunny Fatale, featuring designs from 18 prominent and talented female artists. Some are cute and sweet, others are bold and cruel, but all are irresistible. Each blind boxed 3-inch figure retails for $7.95, comes with a trading card and some include accessories. Dunny starts seducing on Janurary 28th. Raised in the great white north of Canada, on sugar-infested cereal, 80’s music, Peanuts comics, and classic Nintendo games Cameron Tiede has always stayed a kid. In the 90’s, he ventured down to Southern California to thaw out and attend Art Center College of Design where he studied illustration. Cameron’s signature style is infused with raw energetic characters and stimulating colour. Described as “illuminated innocence,” his work is as playful as it is honest. 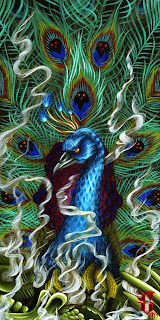 Currently he draws, paints and designs for himself and others. He is working on a number of limited edition art toys which are due out this year. 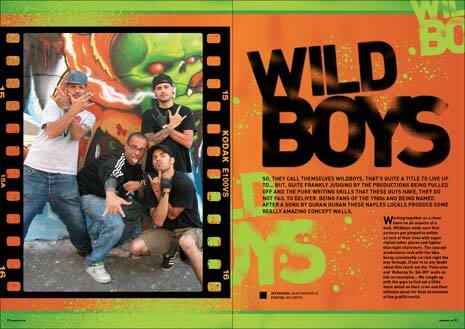 Some of his clients have included Disney, Mattel, Nickelodeon, and Warner Brothers. His work is both exhibited and collected around the world. Toy2R USA Now more than 300 customized Qees in the Qee Gallery at www.toy2rusa.com. 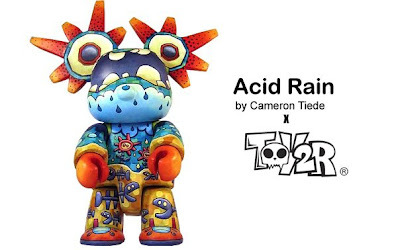 Check out customs by some of the biggest names in the designer art toy community as well as pieces from across the globe from talented artists. Submit yours today! 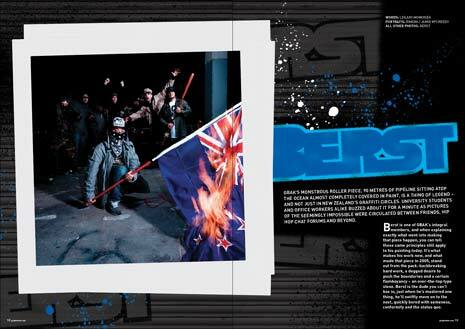 Featuring interviews with: BERST (New Zealand), WILD BOYZ (Italy), TWESH (Italy) and KAK (UK). 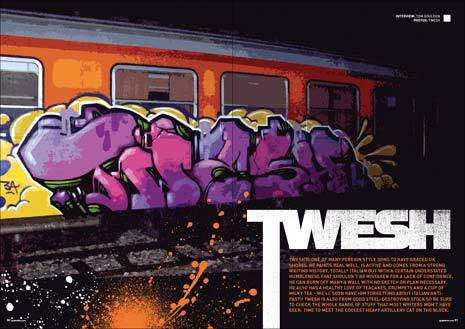 Plus the usual mix of Benchtalk news and reviews as well as a hoard of sick new flicks from around the world. 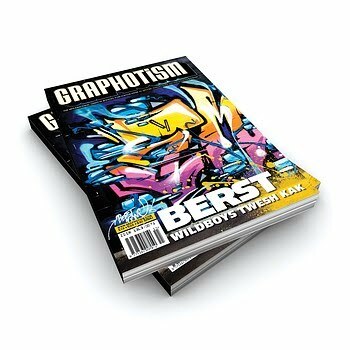 Graphotism is the world's biggest, longest running and most influential graffiti art publication. Documenting the scene since 1990. Book format, 164pgs. Now available for purchase at Spaghetti Project... you can still smell the ink on the pages!!!! Mori Chack's bloodthirsty icon is back and his appetite for viciousness is bigger than ever. You can try to domesticate this 5-inch beast, but if history is any indication, not even an endless supply of the red stuff, or a well-made muzzle, will tame him. Will be arriving soon at Spaghetti Project!!! Limited in quantity so don't miss out!!! From soothsayers and scavengers to skeletons and squid women, each of the 11 blind boxed figures, including the 2 chases, are 3-inches tall and include accessories and an insert that tells their twisted tale. From the dark recesses of Patricio Oliver's mind come the bizarre children known as the Cucos. 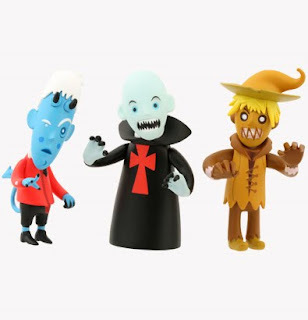 Led by the elusive and sinister Cursed Twins, this collection of 3-inch evildoers only exist to cause madness and horror wherever they go. This blind-boxed series includes 13 figures, 2 of which are chases. 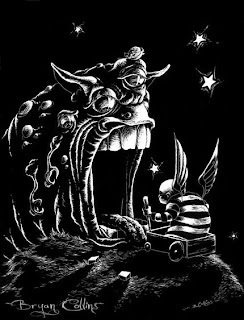 This is a Limited Edition T-Shirt which features the piece "Living Through Empty" by Bryan Collins. 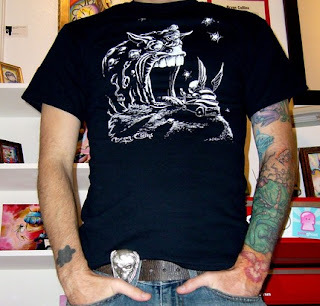 The art was created on scratch board, so the original piece is white on black just like the shirt. These are limited in number with only 100 made. Gildan 100% pure cotton black shirt. Scott Sketo is an artist located in Richmond, VA. By day he is a mild mannered tattoo artist at Enigma Studios and at night he's drinking bourbon and scheming to create imagery that will burn into your retinas. All this just in hope of one day attaining a pair of 10.5 Heineken Dunks.